Pro Audio DSP's first product is a novel dynamics plug‑in, with applications ranging from de‑essing to loudness maximising. 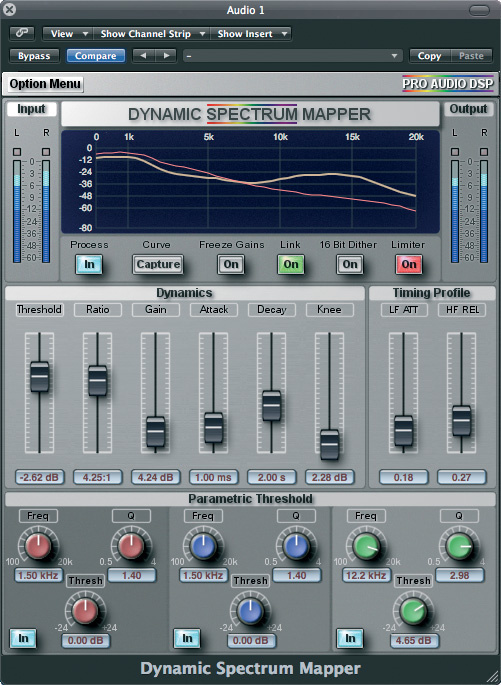 The DSM, or Dynamic Spectrum Mapper, plug‑in takes three processors with which many of us are already familiar — the fingerprint equaliser, the dynamic equaliser and the multi‑band compressor — and combines them in an unusual way. In essence, DSM is a multi‑band dynamics processor with the ability to calculate the threshold levels of the individual bands according to the spectral response of a source or target audio file. According to the manufacturers, DSM is "intended to provide multi‑dimensional control over both the spectral response and dynamic characteristics of audio programme, in order to bring a whole new dimension of facility and artistic ability to the sound engineer”. Sounds like no Time Lord should be without one! Currently, DSM is Mac‑only, and is available in RTAS and Audio Units formats, both protected via iLok. 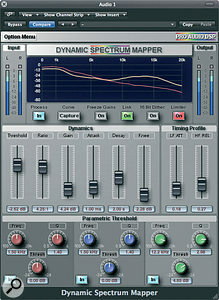 It was created by former Sony Oxford plug‑in designer Paul Frindle, and bears a noticeable graphical resemblance to the existing Sonnox plug‑ins. As with a conventional fingerprint EQ, the plug‑in splits incoming audio into multiple frequency bands (though we're not told how many) and is able to analyse and store the average frequency spectrum of a section of audio, be it a full mix, solo instrument or vocal, to act as a target response. A fingerprint EQ, such as Logic's Match EQ or TC's Assimilator, then compares the target spectrum with that of the audio actually being processed and adjusts the filter bank so that the average spectrum of the current audio matches that of the target. DSM operates somewhat differently, as it uses the target analysis curve to set the thresholds for compressors in each band, so that gain reduction occurs in each frequency band only when the current audio level exceeds the target curve threshold in that band. If the compression ratio is set high enough to act as a limiter, then the processed audio's response will match that of the target's, providing that the level is high enough to reach the threshold. Audio below the threshold still retains its own spectral characteristics. The threshold curve can be modified using three sets of familiar parametric EQ controls (these affect only the threshold curve, not the actual audio) and also by a conventional single set of compressor controls. Further control is available to change the response times of the compressors in a progressive manner across the frequency spectrum, and the threshold curve can also be adjusted up or down using the compressor Threshold control. So why would you want to do this? Well, it turns out that there are lots of creative and corrective possibilities for a plug‑in of this kind, not least allowing the source sound spectrum to morph into that of the target spectrum as it gets louder. It can also be used to emulate the softening effect of tape saturation, by lowering the thresholds at higher frequencies and applying a suitable degree of compression. It can even handle de‑essing and de‑popping with minimal audio side‑effects, by using a target spectrum taken from a good part of the vocal where no popping occurs. When a problematic section is reached, gain reduction will be applied to those parts of the spectrum that are louder than normal — specifically, the unwanted sibilant or popping frequencies. Uses suggested by the manufacturer include: "Enhancing the perceived volume and presence of mixes, compressing even the most difficult programme with increased accuracy and musicality, copying and equalising sonic impressions between dissimilar sounding tracks.” The process is also said to be useful for enhancing vocals to increase intelligibility or to match the sound of dialogue from different takes in music or post production. The controls are split into four sections, and the graphical display window shows two curves: the Active Spectrum of the input signal in red (or twin curves in blue, if the two channels are not linked for stereo operation) and the threshold curve derived from the target audio file (which may be modified by the user) in yellow. A Capture button is used to derive a spectrum from a section of the target file: this can be created from a very short sample of audio, or the button can be held down to average the spectrum over a longer time period. In Pro Tools, captured responses can be saved and applied to other projects. Freeze Gains does as its name suggests and maintains the gain at the time the button was pressed, for situations where static processing (more like a conventional fingerprint EQ) would be appropriate. A Limit button prevents sample value overloads that might otherwise result in clipping, though it affects all bands, not just the ones that are peaking, so some artifacts may be audible. A 16‑bit dither option is available for mastering applications. The compressor section features the expected controls for Threshold, Ratio and Gain, plus Attack and Release time constants. There's also a Knee control that moves from hard-knee to soft‑knee compression. The attack and release time settings are common to all bands in the spectrum, but Timing Profile controls have been added in order to vary these with frequency: LF Attack progressively increases the attack time for lower frequencies, and HF Release progressively decreases the release time for high‑frequency signals. As touched upon earlier, there are parametric‑style controls that are used to modify the reference (yellow) curve, and any changes are reflected in the shape of the curve. An Options menu accesses preferences that can change the way the controls and meters respond. The order of work is to first capture the reference or target spectrum, then play the audio to be processed, adjusting the compressor controls (and the parametric controls, if required) to instigate the necessary amount of compression when the audio exceeds the threshold curve. I found it simplest to paste a section of the target audio at the end of the track I was processing so that I could capture it, then return to the song to hear the result right away. Setting a lowish threshold and a very high ratio is the best way to hear what the captured curve really sounds like before making the necessary adjustments. I found the DSM controls easy to use, though I'd have liked part of the display to show the actual amount of gain reduction taking place, perhaps by means of a shaded area under the current audio spectrum curve, like the system used in Logic's multi‑band compressor. I also noticed that the curves created are far more 'smoothed' than the ones on typical fingerprint equalisers, so no really fine detail shows up. On complete mixes, the results that can be achieved in sound‑matching invariably depend on how similar the styles of music are in the first place, but a benefit over conventional fingerprint EQs is that the spectrum only changes when the audio level reaches the threshold — below that level it retains its own character. This is useful, as you can create mixes that have lots of detail in the low‑level sections but get smoother at higher levels so as to prevent listener fatigue. I also worked with some vocal tracks and distorted guitar parts, again with a fair amount of success, especially when I also made use of the three‑band parametric section to modify the curve to get the tonal result I was after. As a rule, you don't get exactly the sound suggested by the reference audio curve, but rather a flavour of it, and when used on mixes, the clarity and punch can be enhanced quite significantly by using the parametric‑style adjusters, without the end result sounding obviously processed. This is clearly one of those plug‑ins that rewards experimentation, because it is far more capable that it might appear from its description. It is very powerful as a dynamic enhancement tool and, of course, there are those corrective uses, such as reducing sibilance and popping. The fact that the process is unfamiliar and doesn't have a single specific aim may make it a hard sell, but I think those users who embrace it will find it a very useful tool. I'm not aware of any other plug‑in that combines fingerprint EQ and multi‑band dynamic processing in the same way as Dynamic Spectrum Mapper. Very versatile for mixing and even mastering. The process itself is not immediately intuitive, so you need to think about what you're trying to achieve. DSM is an ingenious plug‑in that can be used to match sounds (to a degree) or enhance them in a way not possible with other processors.